Did you know that a lion’s roar can be heard up to five miles away? That an astronaut’s heartbeat slows down in space? Or that about £35 billion of Monopoly money is printed each year? Find out in a bumper book of bizarre facts from the folks in the know! Stuffed with all the strangest, most unbelievable and most outrageous facts you could possibly want to know, this brain-bending book doubles as education and brilliant entertainment. 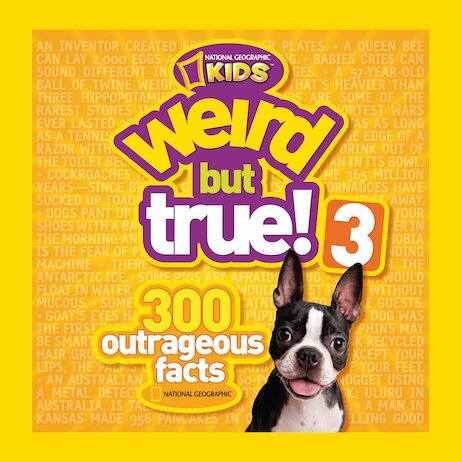 In a colourful pocket size with a cool graphic layout, it’s a treasure-trove of 300 wild and wacky bits of trivia from the boffins at National Geographic Kids. Plus, for the first time ever, it now includes freaky facts sent in by readers like you!